Reinsurers, for the most part, have been struggling to optimize one side of the balance sheet and its ability to contribute to the return measures and competitiveness of the organization. This is evident by declining investment yields that are due in part to artificially depressed yields on fixed income securities, which may prove to be anemic compared to their inherent risk. Over the last decade, the global reinsurance industry has been losing a significant amount of surplus growth opportunity from much lower than historic fixed income investment yields. Whether you are a proponent or not, convergence capital is most likely here to stay. One manifestation of this convergence capital is the hedge-fund-sponsored reinsurer. In an environment where rate-online has become much more competitive and the peaks of the underwriting cycle have softened in recent history, reinsurers are looking for strategies to optimize the risk-reward balance. There are many ways to accomplish this, one of which is the hedge fund sponsored reinsurer model of which most are still in the start-up phase. To that end, it is uncertain what the specific long-term results will be compared to more traditional reinsurers. 2015 represented a challenging year for all reinsurers and hedge-fund-sponsored reinsurers were not immune to the adverse market trends. On the underwriting side of the risk and reward continuum, the soft pricing environment in almost all lines of business and geographies has led to shrinking premium volumes or at least lackluster growth for those companies that are exercising underwriting discipline. Premium growth and underwriting performance has been disappointing across the “hedge fund re” composite with a combined ratio of 111.5%, a loss ratio of 70%, and an underwriting expense ratio of 41% for 2015 (Exhibit 1). Of course, the startup nature of most of these entities and related costs coupled with less than optimal premium volumes compared to fixed expenses has led to an inflated expense ratio. A normalized expense ratio would produce a combined ratio more in the 100%-105% range, which is still high by about 10 points compared to the U.S. and Bermuda reinsurance composite. It should also be noted that none of the companies in this “hedge fund re” composite were able to avail themselves of prior year reserve takedowns that have been heavily utilized by companies in the U.S. and Bermuda composite that for 2015 represented a 6-point benefit to the loss and combined ratios. The more important question yet to be answered is how reliable are the current loss picks for these companies. Future adverse reserve development would certainly not bode well against the current backdrop of underwriting performance and lackluster investment returns. Time will tell. Investment results for 2015 for the hedge-fund-sponsored composite were similarly disappointing, with a 0.9% investment yield, with the most adverse performance in the composite being down 22.2% and the most beneficial in the composite being up 25.9%. It is apparent that in an investment climate characterized by significant volatility and a very high P/E ratio compared to historical averages, some investment styles can suffer compared to strategies that have significant diversification assistance from other non-correlated strategies. 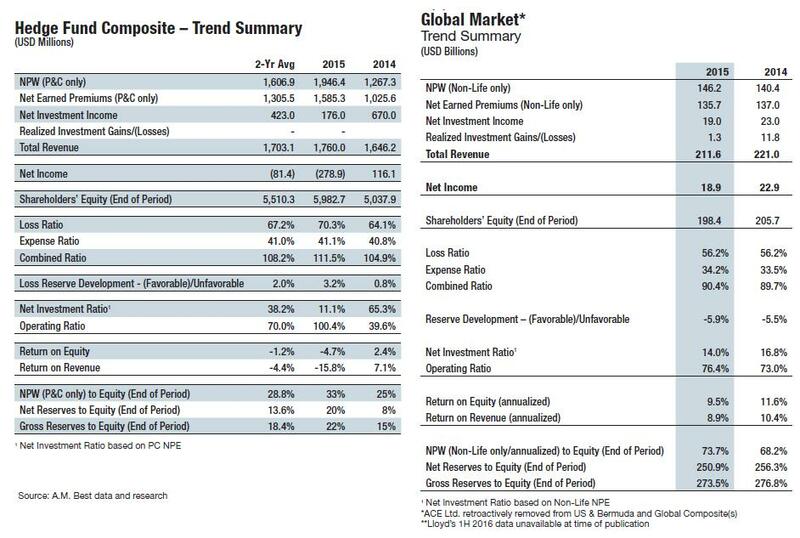 The USD 279 million net loss realized by the hedge-fund-sponsored composite for 2015 was equally disappointing. Return on equity measures were adverse by 4.7% for 2015. While investment and overall performance has been disappointing, it is too early to jump to the conclusion that the Hedge Fund Re model does not work. The level of investment volatility experienced is not unexpected and is contemplated in our various stress tests. The success of these strategies has to be evaluated over the long term and through various market cycles. The robust capitalization of these companies provides the bandwidth to achieve success. The ability to absorb investment volatility is apparent in view of underwriting leverage. Net premium to surplus for the hedge-fund-sponsored composite was approximately 33% for 2015, compared to approximately 60% for the U.S. and Bermuda composite. Likewise, net reserves to surplus for the hedge-fund-sponsored composite was approximately 20% for 2015 compared to approximately 121% for the U.S. and Bermuda composite. The hedge-fund-sponsored reinsurers that have been operating longer had higher leverage measures than the newer entities but none had higher operational leverage than the average of the U.S. and Bermuda composite. In general, this model mandates a lower level of underwriting leverage given the greater asset risk employed. The hedge-fund-sponsored composite, both in aggregate and for each company individually, exhibited strong risk-adjusted capitalization at year-end 2015 despite some of the recent operational challenges. A.M. Best’s rating approach contemplates stress scenarios on both sides of the balance sheet with simultaneous volatility in the investment markets and a prolonged reinsurance pricing environment. Overall operating performance in general for the reinsurance market has been characterized by mediocre operating and return measures for the last several years. New entrants in this market have been struggling in this challenging environment and hedge fund sponsored reinsurers, taken as a group, experienced adverse results from both sides of the balance sheet in 2015. While this level of performance is not what one would hope for, this level of volatility has been anticipated and accounted for by A.M. Best’s stringent start-up requirements. As with any start-up, it generally takes several years for a strategy to take hold and reach adequate economies of scale. A.M. Best has been rating hedge-fund-sponsored reinsurers for approximately ten years. During that time, there have been several iterations of the model that have developed. Model One we refer to as the “build” model and represents the initial type of hedge fund sponsored reinsurer. The build model is characterized by a stand-alone underwriting platform that is built from scratch by hiring individuals for underwriting, risk management, claims, etc. These individuals are meant to form a team that develops their own view of risk and seeks to underwrite business through the broker market, Lloyds, and through existing relationships. The investment platform of the build model can be either a single alternative asset manager like Greenlight Capital or Third Point Capital, or it may be a mosaic of hedge funds assembled by the management team, usually with the help of a third party advisor like Goldman Sachs or The Blackstone Group. Currently rated examples of the build model are Greenlight Re, Third Point Re, Hamilton, and Fidelis. Model Two we refer to as the “partnership” model and represents the next phase on the timeline of hedge-fund-sponsored reinsurers. The partnership model is characterized by reinsurance business generation from an existing underwriter. Basically, the business is priced, written, and risk-managed by an entity utilizing established platforms to source business from tested distribution channels. The investment platform of the partnership model options are the same as for the build model. Both Watford and Harrington are examples of the partnership model. Model Three we refer to as the “segregated portfolio” model, which represents the next phase on the timeline of hedge-fund-sponsored reinsurers. The segregated portfolio model is characterized by a cell captive type SPV, either a segregated portfolio company or an incorporated cell company, where several different owners and hedge funds come together in a single SPV to match different alternative investment strategies with a source of reinsurance business from a common source. In some ways, the segregated portfolio model is a cooperative of sorts where a smaller allocation of unrelated investment strategies can be matched against a reinsurance business flow from an established underwriter or a panel of such entities. The cell owners would participate on the results of their own investment performance and their pro-rata share of the performance of the reinsurance business assumed. There are currently no rated segregated portfolio model entities to our knowledge. Parenthetically, one of the hedge fund-sponsored reinsurers is large enough in terms of gross premiums written to qualify as one of the Global Top 50 Reinsurers. In fact Third Point Re moved up that ranking from 49 to number 44 over the course of 2015 (Exhibit 2). This is an extract from the Best’s Special Report on Global Reinsurance “Innovation:The Race to Remain Relevant”. Steve Chirico can be reached at steven.chirico@ambest.com. To access a copy of this special report, please visit http://www3.ambest.com/bestweek/purchase.asp?record_code=253443.